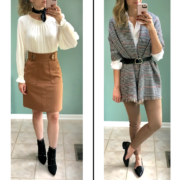 I went on a spending freeze for the month of May and was planning to continue my no-buy commitment through June too…until I discovered PoshMark. If you’re not familiar, it’s a downloadable app you can use to resell pieces from your closet that you no longer wear. I’ve found it to be so much simpler than eBay because it eliminates the bidding process so you can set the amount you want to make for each item. For the last few weeks, I’ve been successfully purging my closet & I used the money I earned from my PoshMark sales to buy the items below. In addition to what’s shown here, I also ordered these denim shorts (recommend sizing down) and this chambray jacket (love!). I have yet to use PoshMark but I have definitely been meaning to! Love your recent purchases especially the sandals and both skirts! I too have discovered Poshmark, and got some extra money (and sometimes, some good deals there :p) I just wanted to stop by and said that moto vest is so awesome! I'm not a vest wearing kind of a gal but I can see me wearing that. Great purchases! 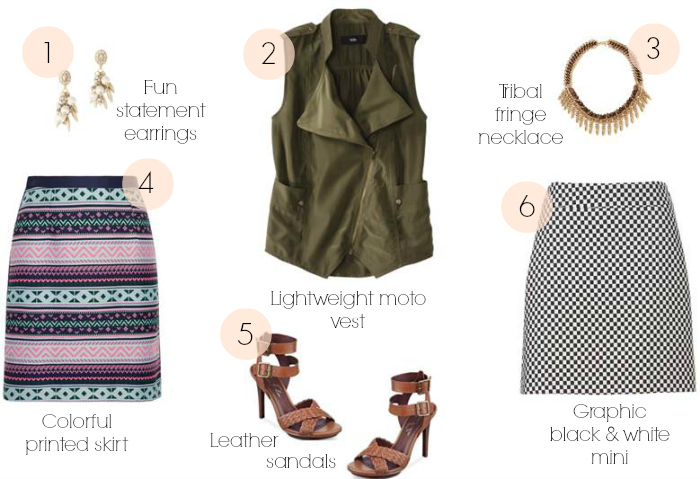 Ok, that Helene Berman skirt and Mossimo moto vest are amazing! I especially cant believe that the vest is from Target! I love how feminine it is! Great new purchases! Great buy I wanted that jacquard skirt and it's no longer available in my size, I got the gap boyfriend too but the long version. great mind think alike. Great purchases and I really need to get on poshmark. I can't wait to see how you style that F21 necklace. It looks fab! If you're interested, I'm hosting a giveaway for a Gerard Yosca necklace from his upcoming collection. Enter here. I need to look into that. I have some stuff in my closet that needs to go. Love that black and white skirt! Can't wait to see how you wear it. That colorful printed skirt is amazing, I think I need it in my closet! I love this motto vest! Such a versatile piece! Ooo I love that moto vest!! Super cute. I love all of those purchases! Especially that moto vest! I really need to add one to my closet! The moto vest is fantastic! I'm loving all of your recent purchases. Great finds! I have bought several things from Poshmark lately. I am dying over the first skirt! I really need to get on poshmark! Great buys! i love the black and white mini! I tried on that Target vest yesterday and am thinking of going back today to get it. Definitely a staple piece! I agree with Yi-chia – must get the Jacquard mini. Genius! I love Poshmark's concept and those jean shorts you bought. Thanks for sharing! Awww! Love this post sooo much, Kim! Major fan of your closet and love all the new pieces you snagged with your earned money! that moto vest is awesome! Love that skirt! So bright and fun! I've never heard of PoshMark. I seriously need to clean out my closet! How does it work to sell things on there? Is it difficult? I don't know much about computers so I'm wondering if I could understand the process. :)Thanks! This post was so helpful. I'm LIVING for that Moto Vest from Target. I have to have it! Will be checking my local stores this weekend. And I had no idea about Posh Mark, I'm gonna have to check it out and share with everyone I know! Wondering if you are still considering a tutorial on "scarf knotting"? I haven't forgotten! I'm so sorry it's taken me a while. We are going to try & shoot the video tomorrow and I'll get it put up on Facebook as soon as I can. Thank you for your patience! Loving the colorful printed skirt! Everything you got is SO cute! you have the best taste in clothing! wow,I never heard about PoshMark thank you for the info. I too am trying to free myself from shopping too much. I cant believe you purchased all these wonderful things after re-selling the pieces from your closet. Bravo!!! Do you think the chambray poncho would be rain resistant? What do you use to create your photo collages? You have a great blog . What do you use to create your photo collages? I love your blog. I use a combination of PowerPoint, PhotoShop & PicMonkey for my collages. Sounds complicated, but it's a system I've found that works well for me. Feel free to email me directly if you have more questions! love everything you bought. I think I am going to need to try PoshMark! Ooh I love those Marc Fisher heels! I'm sure they would look just as cute with a dress or shorts! ADORE the moto vest and have been looking for one in white… do they have that style in white?! I'll have to check my local target. PS also love that skirt- good picks! The moto vest from Target looks amazing! Can't wait to see how you style it for summer!